On Wednesday, April 6th, students from the Immigration Law and Litigation Safe Passage class presented to NYLS faculty and students during Faculty/Student Presentation Day. The students’ presentation, entitled “Standing Up for Immigrant Kids,” highlighted their work as clinic students with the Safe Passage Project over the course of the academic year. 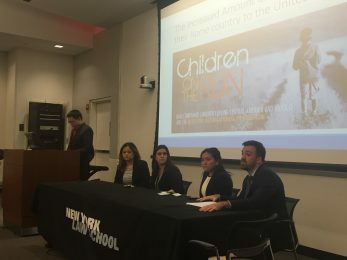 During their 40 minute presentation, students explained to audience members how unaccompanied immigrant children migrate alone to the United States, the reasons for their journey, what happens to unaccompanied children once they are apprehended by immigration authorities, and how children come to New York. The students then explained their role of interviewing children in Immigration Court, acting as “friends of the court” to obtain adjournments of immigration hearings for more time for Safe Passage to assist the children to find pro bono lawyers, and making initial assessments of the children’s eligibility for immigration relief. Students discussed two immigration relief options for which many unaccompanied children are eligible- Special Immigrant Juvenile Status (SIJS) and asylum. The students’ presentation had a soccer theme, to explain to audience members the different actors and “sides” in immigration removal proceedings involving unaccompanied children, and also to celebrate the soccer games hosted by Safe Passage for immigrant kids in order to build friendship and a support network in the United States. Professors Benson and Thomas are so proud of the clinical students for their hard work in preparing this thoughtful, professional presentation.